This article suggests foods with the highest Omega 3 to Omega 6 ratio so that you can achieve a better balance in your diet. There is no daily value set for omega 3s, but the adequate intake (AI) per day is set at 1600mg. This is used to calculate the AI of Omega 3s for the foods in the list. 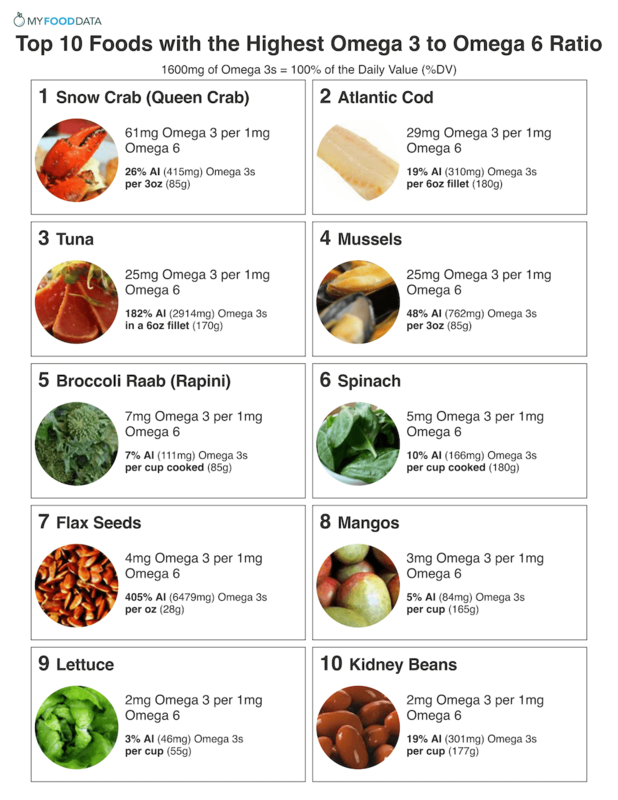 Below is a list of foods with high omega 3 to omega 6 ratios, for more, see the list of foods high in omega 3s, and the complete ranking of over 200 foods high in omega 3s per omega 6. See the complete list of seafood and fish with a high omega 3 to 6 ratio. See the complete list of vegetables with a high omega 3 to 6 ratio. -Chia seeds, hemp seeds, and walnuts are the only other seed (or nut) with a good omega 3 to 6 ratio. Papayas also have a high omega 3 to omega 6 ratio. See the complete list of fruits with a high omega 3 to 6 ratio. See the complete list of beans with a high omega 3 to 6 ratio.